An Antane Kapesh1 is an Innu2 writer and activist. 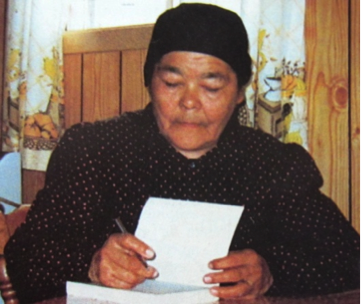 Born on her traditional territory on March 21, 1926, Kapesh was raised in and practiced a traditional Innu life. She grew up speaking Innu-aimun, the language of the Innu people, with both her mother and father (a caribou hunter), who taught her to hunt, live, and thrive on her own territory. In 1942, she married taking her husband’s last name “Kapesh”. They had eight children and many grandchildren. She and her husband were able to maintain their traditional lifestyle until 1953, when the Maliotenam reserve, near the town of Sept-îles, was established and they were moved into town. In 1956, the family moved again, along with many other Innu families, living in tents close to town in hopes to get work at the Iron Ore Company (IOC). Here, Kapesh and her husband purchased a small shack once her husband found work. In the same year, they were evicted by Iron Ore and the Kapesh family home, with the other families who had followed the same path, was moved three miles away to Lake John. For the next twenty years, Kapesh fought hard to prevent another forced move. As chief of the Innu band in Schefferville from 1965 to 1967, Kapesh worked hard to have the government build houses for them in Lake John, where the community was living, instead of back in town. After great consideration, Antane Kapesh decided to begin writing down her life story and colonial experience in the 1970s. Her experience as an Innu woman was unique because she had gone from living off of her the land in her own culture, to being forced into the mainstream ways of life. She was forced to assimilate into a society that rejected her. She discusses these experiences in her first book, Eukuan nin matshimanitu innu-ishkueu (I am a Damn Savage) (1976)3. In this book, she calls out the police, the liquor sellers, the game wardens, the residential schools, and the Quebec and Canadian governments, holding them accountable for the harm they have done to her community. She uses her own personal experiences as proof, writing about the language barrier between her and her own children after they were forced to attend a French school. She notes that her father was unable to hunt on his own territory for food because of development and biased hunting regulations. Kapesh writes using both pronouns, I and we, blending her individual and the greater Innu experience. Educated entirely by her own parents in her own culture, it is a testament to Kapesh’s ferocity and resiliency that she was able to use a foreign form of story telling to stand up to that same foreigner, incorporating elements of Innu oral tradition and storytelling as well. An Antane Kapesh published her second book Tanite nene etutamin nitassi? (What did you do with my country?) in 1979. It tells the story of colonization of Turtle Island through the metaphor of a child and the “Polichinelles,” representing Indigenous peoples and settlers respectively. This second book highlights how colonizers betrayed and attempted to ruin the people who first helped them (Boudreau). Like her first book, this was written in Innu-aimun and translated into French, in a facing page edition. This story was adapted for the stage in 1981 by Kapesh and José Maillot (who translated her first book into French). In both her books and in her life, her intention was for Innu children to learn about their culture and about their language: "I want to write to write to defend my culture, so that the Montagnais [Innu] of the future will know that their people have lived otherwise than in a reserve.” She attempted to share a new story with a wider audience, to make her people, her language, and her experiences as an Innu woman known. She passed away in 2004. Antane Kapesh, An. Je Suis Une Maudite Sauvagesse: Eukuan Nin Matshimanitu Innu-Iskueu / Anne André French Translation, José Mailhot, In collaboration with Anne-Marie André and André Mailhot. 1976. Antane Kapesh, An. Qu’as-tu fait de mon pays? : Tanite nene etutamin nitassi? Montréal, Éditions Impossibles, 1979. Boudreau, Diane "17 An Antane Kapesh, écrivaine (1926-2004)” Press Books. https://femmessavantes2.pressbooks.com/chapter/an-antane-kapesh-1926-2004/. Retrieved 12 May 2018. Boudreau, Diane, “An Antane Kapesh, la mémoire montagnaise”, Châtelaine, April 1988, p. 200-202. Dominguez, Luis. Cultural Resistance and Native Testimonio in the Americas: A Study of the Life Stories by Juan Pérez Jolote, Nuligak Kriogak and An Antane Kapesh, University of Sherbrooke (Canada), Ann Arbor, 2012. ProQuest, https://search.proquest.com/docview/1312499193?accountid=5705. Mailhot, Amélie-Anne, et al. “La Perspective De l’Habitation Politique Dans Je Suis Une Maudite Sauvagesse/Eukuan Nin Matshimanitu Innu-Iskueu d’An Antane Kapesh.” Recherches féMinistes, vol. 30, no. 1, 2017, pp. 29–45. 3. The book was translated into French in 1982 and the publishing of an English version is currently in the works.